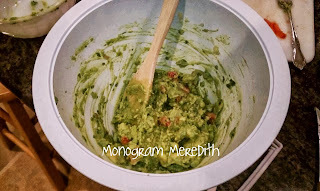 I figured I'd write my first post about the thing we all know avocados best for: guacamole. I mean, its existence is why I even thought of this crazy avocado series. Like I said yesterday, it's always worth the extra 60 cents. But when you can make it at home, it's even better. And happy Labor Day, guys! Of course, guacamole's a fab side to bring to any Labor Day get-togethers...! My family's obsessed with homemade guacamole, but every time my mom makes it, it goes bad before it's all gone. So usually, we turn to this stuff, and it's great. I mean, really. 100 calories for this little packet and you're good to go! And, you can open one package and eat it all without the rest of it going bad. But when you're really feeling some homemade stuff, this is what I made and fell in love with it. 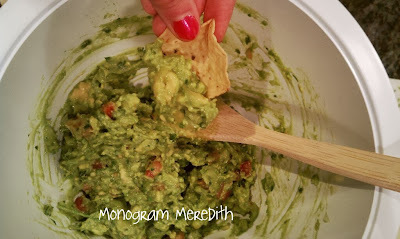 The recipe is from Simply Recipes and is accurately named 'Perfect Guacamole'. Ummm, yeah, it's pretty perfect. The best part of this is, of course, the avocado (have you not understood the whole point of this week?! ), but second, the cilantro. My mom and I are cilantro-crazed; we love it in everything! She makes this black bean salsa (to be posted later!) and it's always full of cilantro. Cut avocados in half and remove pit. Place avocados in a large mixing bowl and mash with a fork. Add the onion, cilantro, salt, lime juice, and tomato, and stir and mash with a large spoon. Chill for half an hour in a closed container, then serve. It's all about the guac, guys.